VISIT US WITH YOUR KIDS IN DUBAI EID SURPRISE 2015 at the Karama Park for 3 days, on 22nd-24th 2015 from 6:00pm to 12:00. A ONE STOP OF FUN, WORKSHOP FOR KIDS, ENTERTAINMENT, & ENJOY SHOPPING TOO. 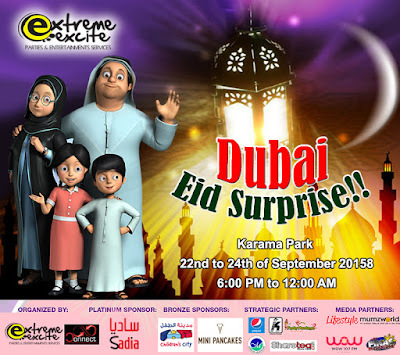 You can be as one of our VENDOR, for booking please call EXTREME EXCITE team to 055-7003115. Sponsored by: SADIA, PEPSI,MINI PANCAKES,SHARE TEA,KNIGHT SHOT,FUNKY MONKEY,ASTER DM HEALTH CARE,CHILDREN CITY, MUMZ WORLD,LIFE STYLE, PINAS MUSIC ZONE, WOW RADIO.